The California Earned Income Tax Credit (CalEITC), established in 2015, is a refundable state tax credit that helps low-earning workers and their families make ends meet and build toward economic security. Yet, fewer than 1 in 5 visitors to county human services offices who were likely eligible for this new tax credit had heard of it, according to a Budget Center survey. (County office visitors were surveyed because many would likely be eligible for the CalEITC or know people who are eligible for it.) 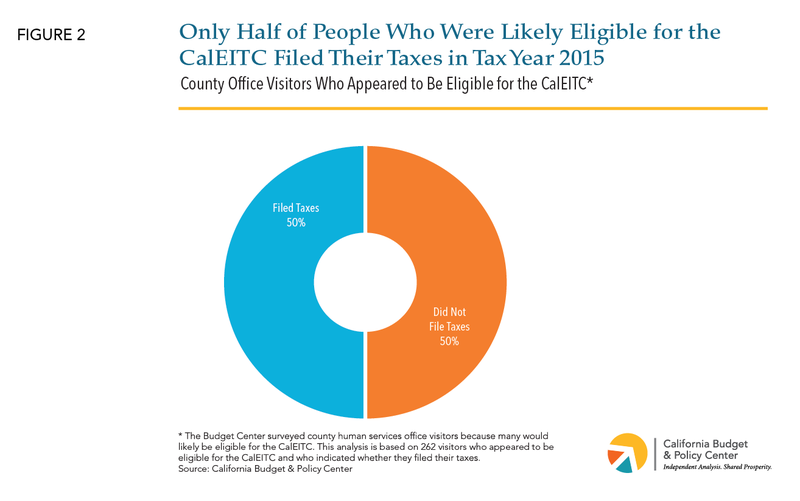 In addition, only half of respondents who were likely eligible for the CalEITC filed their taxes for tax year 2015. These findings suggest that California needs to do more to raise awareness of the credit in order to boost participation. The survey also found that most people who were likely eligible for the CalEITC and did file their taxes paid a tax preparer even though they would have qualified for free tax assistance. This means that many people did not get the full benefit of the CalEITC because they paid tax preparation fees. This report recommends strategies to maximize the success of the CalEITC, including by supporting research to better assess CalEITC utilization gaps and determine which outreach strategies are most effective, bolstering efforts by community organizations and county offices to promote the credit, and expanding and promoting free tax preparation services. What Is the CalEITC and How Does It Work? People qualify for the CalEITC based largely on how much they earn and how many qualifying children they are supporting. Families with multiple children qualify for the credit for tax year 2016 if they have earnings that do not exceed $14,161, while those with just one child qualify if their earnings do not exceed $10,087. Individuals without qualifying children can benefit from the CalEITC if their earnings do not exceed $6,717. The size of the credit people can receive from the CalEITC also depends on how much they earn and how many children they are supporting. Working families with three or more qualifying children can receive up to $2,706 for tax year 2016, those with two children can receive as much as $2,406, and those with one child can receive up to $1,452. Individuals who do not have qualifying children are eligible for a much smaller credit — a maximum of $217. The CalEITC is designed to build on federal working-family tax credits. Families with three or more children who qualify for the maximum CalEITC, for example, can see their incomes rise by as much as 92 percent from the CalEITC, in combination with the federal EITC and federal child tax credit. In this way, the CalEITC may enhance the federal EITC’s well-documented benefits to children, families, and communities. Just 18 percent of those who were likely eligible for the CalEITC had heard of the credit (Figure 1). Similarly, just 15 percent of all respondents had heard of the credit. Among all respondents, Latinos were far less likely to have heard of the CalEITC. Only 10 percent of Latinos surveyed had heard of the credit compared to 25 percent of white respondents. These are dollars that are clearly needed. The vast majority of respondents who were likely eligible for the CalEITC (80 percent) had faced at least one major hardship in the past year, such as not being able to afford enough food, falling behind on rent or on utility bills, or having to forego necessary health care due to a lack of money. Seven in 10 people surveyed who were likely eligible for the CalEITC and filed their taxes in 2015 (70 percent) paid a tax preparer even though they would have qualified for free tax assistance given their extremely low incomes (Figure 3). This suggests that many workers did not receive the full benefit of the CalEITC or other tax credits because some of their tax refund went to tax preparation fees. Although tax preparation fees are rarely transparent and can vary widely, studies suggest that they tend to range in the low hundreds of dollars. For example, the US Government Accountability Office found, in one metro area, fees ranging from $160 to $408 for a single mother with one child who qualified for the federal EITC in tax year 2013. Also, a national survey of tax preparers found that the average fee charged for filing a federal and state tax return without any itemized deductions was $176 in 2016. By comparison, heads of household with one child received an average CalEITC of $610 during the credit’s first year, according to state data. This suggests that tax preparation fees could have substantially reduced the benefit of the CalEITC for many low-earning workers. Lack of awareness of free tax preparation services may help explain why many workers who were likely eligible for the CalEITC paid to file their taxes. Only 25 percent of tax filers surveyed who were likely eligible for this credit knew of a free tax preparation service in their community (Figure 4). High use of paid tax preparers may also reflect insufficient access to free tax services. California has over 900 Volunteer Income Tax Assistance (VITA) sites, which provide free tax preparation services by volunteers who are trained and certified by the Internal Revenue Service (IRS). However, nearly half of the ZIP codes with the highest percentages of households that are potentially eligible for the CalEITC have no VITA sites at all, according to United Ways of California. In addition, many VITA sites lack the capacity to meet the need for free tax preparation. Just 42 percent of people surveyed who were likely eligible for the CalEITC had heard of the federal EITC, even though most of them likely qualified for it (Figure 5). By contrast, awareness of the federal EITC among very-low-income parents nationwide ranges between 55 percent and 66 percent. Latino respondents were far less likely to have heard of the federal EITC than were other survey respondents. This is similar to national surveys, which find lower rates of awareness among Latinos, and particularly those who completed surveys in Spanish. Use state data to more precisely assess CalEITC utilization gaps as well as evaluate the effectiveness of targeted outreach strategies. While the survey findings described in this report, together with other research, suggest that many eligible Californians may have missed out on the CalEITC in its first year, a precise participation rate is not known. This is because, as discussed earlier, the CalEITC targets workers who are not required to file state personal income taxes, which means that tax filer data alone cannot be used to determine how many people likely qualify for the credit. California could better assess CalEITC utilization — overall and across demographic groups — by linking data across state agencies. For example, California could pursue a data-sharing effort similar to one undertaken by Virginia, which facilitated a collaboration between that state’s tax board and social services department to produce a more accurate picture of federal EITC participation among people receiving major public benefits. Specifically, Virginia used a combination of state tax filer and social services data to estimate which public benefits participants were likely eligible for the EITC, and then determined how many of those participants actually filed their taxes and claimed the credit. This revealed that 34 percent of public benefits participants who were likely eligible for the EITC did not claim the credit in 2006, largely because those individuals did not file their taxes. More importantly, these data allowed Virginia to target EITC outreach efforts specifically to this group of nonfilers and to measure the effectiveness of these efforts by tracking whether they boosted EITC participation over time. A similar data-sharing effort in California — potentially linking the Medi-Cal Eligibility Data System (MEDS) to Employment Development Department (EDD) and Franchise Tax Board (FTB) data — could provide valuable information that would help better tailor CalEITC outreach strategies to groups who are less likely to claim the credit and to learn which strategies work best in boosting claims. Increase support for community-based efforts to promote the CalEITC. The 2016-17 budget agreement included $2 million for grants to help communities expand their efforts to raise awareness of the CalEITC. However, the Governor’s proposed budget for 2017-18 (the state fiscal year that begins on July 1, 2017) does not include funding to maintain or expand these efforts. Given that awareness of the CalEITC appears to be low, state policymakers could continue, and potentially expand, this grant program so that community groups can maintain their promotional efforts year-round and build on the educational strategies that they have developed. Indeed, efforts to raise awareness of the CalEITC need to be ongoing because the workers who qualify for the credit will likely change from year to year. In addition, because little is known about which educational strategies are most effective, policymakers could require a more robust evaluation of the strategies supported by this grant program. Support an EITC coordinator to facilitate efforts to raise awareness of the state and federal EITCs among county clients and connect them to free tax preparation services. Support peer-to-peer learning opportunities, where counties could share best practices and learn to replicate effective promotional strategies. For instance, some counties train CalWORKs participants to be Volunteer Income Tax Assistance (VITA) tax preparers as part of their welfare-to-work plans, either as volunteer work experience or as subsidized employment. These workers help to both expand the capacity of local VITA sites and promote tax credits and free tax services in their communities. Counties that have established such programs could provide technical assistance to other counties interested in developing similar programs. Help counties operate VITA sites at their offices to facilitate free tax preparation for their clients. For example, state funds could cover the costs of keeping county offices open outside of standard business hours in order to provide tax services. Alternatively, counties could partner with local VITA programs. Support the development and implementation of assisted self-filing workshops where clients learn how to set up free, online tax filing accounts and receive technical assistance with filing their taxes. Such workshops could be easier to establish than VITA sites. Moreover, they would provide a valuable service because many adults — particularly those with low incomes — lack the literacy skills needed to file their taxes on their own. Finance text messaging services to notify clients about tax credits and free tax services. Cover outreach costs, such as printing flyers to be included in required mailers to clients. Strengthen and expand free tax preparation services. Workers with incomes low enough to qualify for the CalEITC struggle to pay for basic expenses and cannot afford to lose part of their tax refunds by paying tax preparers. Although these workers qualify for free tax services, VITA programs that run sites lack the capacity to meet the need and increasing demand for free tax preparation. State funds could help expand the number of VITA sites in high-need communities and enable existing sites to serve more clients. State support could also help VITA programs promote their services and better compete with marketing by paid tax preparers. In addition, state funds could help communities assist people with filing their taxes on their own. Self-filing assistance could be easier for some communities to provide because it would not require as many highly trained and certified volunteers as VITA sites require. Promote free tax filing services, particularly targeting “nonfilers” who could benefit from the CalEITC and federal EITC. One of the key challenges to maximizing participation in the CalEITC is that this credit targets workers who are not required to file state income taxes, as discussed earlier. This means that the credit’s success largely depends on encouraging “nonfilers” to file. Two research projects underway at Stanford University are testing whether mailing postcards with information about free tax filing services increases the use of those services. If these mailings appear to be effective, California could consider promoting free tax filing services through mailers, particularly targeting people who are likely eligible for the CalEITC and federal EITC, but who have not recently filed state income taxes. In addition, California could consider expanding the existing requirement that employers notify workers of their potential eligibility for the CalEITC and federal EITC to include information about accessing free tax filing services. Under current law, this notification is not required to include specific information about how workers can claim these credits. The Budget Center surveyed 938 visitors to county human services offices in eight counties during the fall of 2016. The primary purpose of the survey was to determine whether the visitors had heard of the CalEITC, since many would likely be eligible for the credit or know people who are eligible for it. Budget Center staff designed the survey in consultation with academic researchers and other experts, and whenever possible utilized questions from long-standing national surveys. Initial drafts of the survey were pilot-tested in the late summer of 2016, and several questions were revised based on this testing. Thirteen counties volunteered for the survey and, of these, the Budget Center selected the following eight to participate: Contra Costa, Los Angeles, Merced, Orange, San Bernardino, Stanislaus, Tehama, and Yolo. These counties were chosen in order to include communities in most major regions of the state as well as ensure a mix of urban and rural locations. Participation in the survey was voluntary and, when feasible, respondents were given a $5 gift card for their time. Most surveys were completed online using computers in the county offices. In a few counties that could not accommodate an online survey, Budget Center staff and volunteers distributed paper surveys to county visitors. Respondents could choose to take the survey in either English or Spanish. While the number of survey respondents is large, and large samples increase the reliability of the survey results, the survey was not designed to be representative of all county human services clients or of all people who are eligible for the CalEITC. Also, many of the analyses reported are based on small subsets of the respondents. For example, just over one-quarter of the respondents (266 out of 938) appeared to be eligible for the CalEITC. An estimated 28 percent of survey respondents were likely eligible for the CalEITC for tax year 2015. This determination was based on respondents’ estimated annual earnings from work and the number of children they were living with and financially supporting, which are two key factors that determine eligibility for the credit. Respondents who reported that they lived with their spouse and that someone else in the household worked in 2015 were assumed to not be eligible for the CalEITC in case their spouses had earnings that would have disqualified them for the credit. In addition, a small number of respondents who reported hourly wages below the 2015 statewide minimum wage were assumed to not be eligible for the CalEITC in case these respondents were being paid under the table. (To qualify for the CalEITC, workers must have earnings subject to wage withholding.) The survey did not collect any information about the immigration status of respondents or their family members, and therefore it is not possible to determine whether some of those who otherwise appeared to be eligible for the CalEITC did not actually qualify for the credit. (To qualify for the CalEITC, all family members reported on the tax form must have valid Social Security numbers.) Also, in order to keep the survey short and simple, respondents were not asked to report how much of their earnings came from self-employment, and since self-employment earnings are not counted in determining eligibility for the CalEITC, it is possible that some respondents’ assumed eligibility status is incorrect. 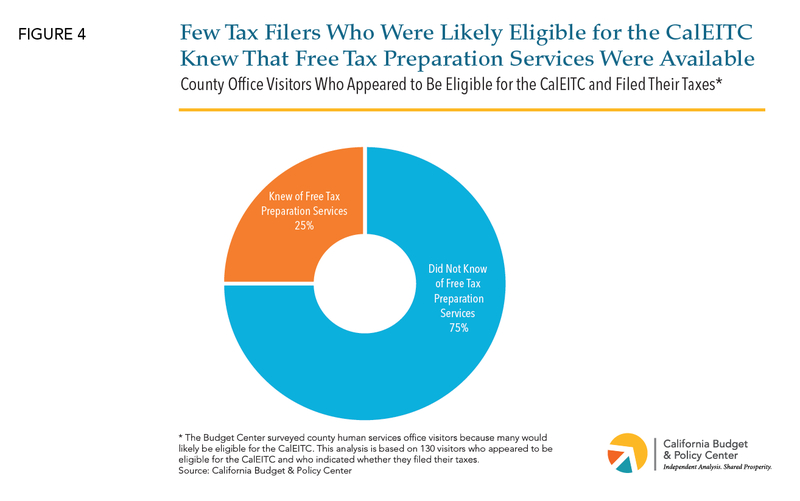 Respondents were not asked whether they actually received the CalEITC or other tax credits. According to experts who have conducted similar surveys, such questions do not tend to provide accurate information because tax filers often do not know exactly which tax credits they received. The survey also collected information regarding how people learned about the CalEITC. However, so few respondents had heard of the CalEITC that it was not possible to reliably report the most common ways that clients learned about the credit. Three-quarters of the survey respondents were women (75 percent) and the majority of all respondents were living with and financially supporting children (76 percent). The majority of respondents had worked in 2015 (58 percent), and these respondents had median annual earnings of $13,173. Four in 10 of the respondents (40 percent) were the only workers in their household, and another 19 percent reported that they and others in their household worked. Nearly half of the respondents (47 percent) were Latino, close to one-quarter (23 percent) were white, and 11 percent were black. The remaining 19 percent were of another race or ethnicity or reported multiple races or ethnicities. Respondents’ ages ranged from 17 to 80, with an average age of 35. This new credit is modeled after the federal EITC, which has provided extensive benefits to families, children, and communities, according to decades of research. For a summary of this research, see Alissa Anderson, State Earned Income Tax Credits (EITCs) Build on the Well-Documented Success of the Federal EITC (California Budget and Policy Center: March 9, 2017). The Budget Center surveyed 938 people who visited county human services offices in eight counties during the fall of 2016 to gauge awareness of the CalEITC. Of these individuals, just over one-quarter (266) appeared to be eligible for the CalEITC based on their estimated annual earnings from work as well as the number of children they were living with and financially supporting (see survey methodology for more information). Most people who participated in the survey reported that they visited the county office to apply for or renew benefits or to access employment services. The vast majority of respondents reported that they and/or their spouse and/or children currently participate in a major public program, such as Medi-Cal, CalFresh, or CalWORKs. CalEITC claims also suggest that many people who were eligible for the credit did not claim it. 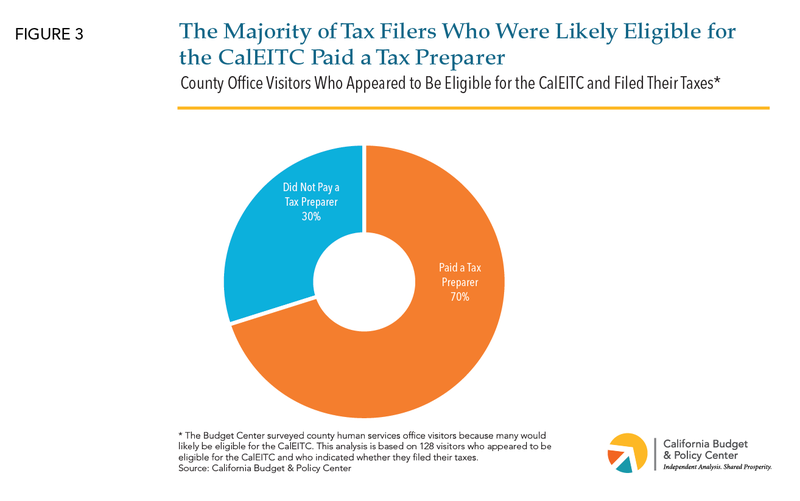 About 385,000 tax filers benefited from the CalEITC for tax year 2015. It is not possible to determine a precise participation rate because it is not known how many “tax units” (families) are eligible for the credit. In 2015, the Franchise Tax Board estimated that around 600,000 families would be eligible. (Personal communication with the Franchise Tax Board on September 22, 2015.) Similarly, a Stanford University analysis of US Census Bureau data also estimated that roughly 600,000 families would be eligible. (Christopher Wimer, et al., Using Tax Policy to Address Economic Need: An Assessment of California’s New State EITC (The Stanford Center on Poverty and Inequality: December 2016).) However, other estimates suggest that only about 466,000 families would be eligible. (Personal communication with the Institute on Taxation and Economic Policy on May 6, 2016.) This suggests that between 64 percent and 83 percent of those who were eligible for the CalEITC claimed it in tax year 2015. By comparison, around 75 percent of California families that are eligible for the federal EITC are estimated to claim it each year. However, EITC eligibility estimates have limitations. For more information, see Alan Berube, Earned Income Credit Participation: What We (Don’t) Know (Brookings Institution: February 15, 2005) and Dean Plueger, Earned Income Tax Credit Participation Rate for Tax Year 2005 (Internal Revenue Service: no date). It is likely that the majority of people who are eligible for the CalEITC are not required to file state personal income taxes. Personal communication with the Franchise Tax Board on April 7, 2017. Just over one-quarter of the people surveyed were likely eligible for the CalEITC. See survey methodology for more information. Since few respondents who were likely eligible for the CalEITC had heard of the credit, it is not possible to reliably report demographic information for this group. Therefore, these figures refer to the share of all people surveyed who had heard of the CalEITC, regardless of whether they were likely eligible for the credit. In this report, white respondents and Latino respondents are mutually exclusive groups and refer to people who said that they identify with only one race or ethnicity. Data for other race and ethnic groups could not be reported individually due to the small number of respondents in each of those groups. For simplicity, the survey asked, “Did you or your spouse file income taxes this year?” without asking respondents to specify the tax year, or whether they filed state or federal income taxes or both. By comparison, 65 percent of Californians who claimed the federal EITC paid a tax preparer in tax year 2014, according to Internal Revenue Service data compiled by the Brookings Institution. Brookings Institution, Earned Income Tax Credit (EITC) Interactive and Resources (December 21, 2016). US Government Accountability Office, Paid Tax Return Preparers: In a Limited Study, Preparers Made Significant Errors, testimony presented to the US Senate Committee on Finance (April 2014). National Society of Accountants, 2016-2017 Income & Fees of Accountants and Tax Preparers in Public Practice Survey Report (no date). Some tax preparers charge tax filers per form, which means that fees would be higher for people who claim credits like the federal EITC and CalEITC because claiming these credits requires additional paperwork. Personal communication with the Franchise Tax Board on November 15, 2016. Surprisingly, awareness of free tax preparation services did not always translate into use of those services. More than one-third of all tax filers surveyed who knew of a free tax preparation service in their community (37 percent) paid a tax preparer when they filed for tax year 2015. VITA sites offer free tax assistance to people who generally make $54,000 or less annually. Only 2.3 percent of California tax filers who claimed the federal EITC filed their taxes at a free tax preparation site such as VITA in 2014. Brookings Institution, Earned Income Tax Credit (EITC) Interactive and Resources (December 21, 2016). Personal communication with United Ways of California on March 8, 2017. For example, United Ways of California, which supports member United Ways that operate many VITA sites, reports that the majority of California VITA sites offer services for limited hours during the week, many lack enough volunteers to meet the demand for services, and that few sites have full-time, paid coordinators who can help the sites run more efficiently. In addition, some sites report that appointments often fill up quickly, limiting their ability to accept additional clients. Personal communication with United Ways of California on March 22, 2017 and April 5, 2017. A slightly smaller share of all people surveyed (37 percent) had heard of the federal EITC. Percentages refer to parents with incomes below half of the official federal poverty line (FPL) and those with incomes between 50 percent and 100 percent of the FPL, respectively. See Katherine Ross Phillips, Who Knows About the Earned Income Tax Credit? (The Urban Institute: January 2001), Table 1. Another national survey found that around 58 percent of low-income parents had heard of the federal EITC. See Elaine Maag, Disparities in Knowledge of the EITC (Urban Institute and Brookings Institution Tax Policy Center: March 14, 2005). Katherine Ross Phillips, Who Knows About the Earned Income Tax Credit? (The Urban Institute: January 2001). Estimates suggest that roughly 1 in 4 eligible California families or individuals do not claim the federal EITC each year, depriving California of more than $1 billion in federal funds annually. See Internal Revenue Service, EITC Participation Rate by States, downloaded from https://www.eitc.irs.gov/EITC-Central/Participation-Rate on March 1, 2017 and Antonio Avalos, The Costs of Unclaimed Earned Income Tax Credits to California’s Economy: Update of the “Left on the Table” Report (Commissioned by the California Department of Community Services and Development: March 2015). Studies suggest that workers who are eligible for, but do not claim, the federal EITC tend to have lower incomes than eligible workers who do claim this credit. Since the CalEITC is available only to workers with extremely low incomes, this group likely includes people who are missing out on the federal EITC. In other words, promoting the CalEITC provides an ideal opportunity to raise awareness of the federal EITC. See Erik Beecroft, EITC Take-Up by Recipients of Public Assistance in Virginia, and Results of a Low-Cost Experiment to Increase EITC Claims (Virginia Department of Social Services: May 2012) and Erik Beecroft, To What Extent Do VDSS Clients Claim the Federal Earned Income Credit? (Virginia Department of Social Services: January 31, 2008). Indeed, national estimates suggest that almost two-thirds of people who were likely eligible for the federal EITC, but who did not claim it, did not file federal income taxes, underscoring the need to target outreach strategies to “nonfilers.” Dean Plueger, Earned Income Tax Credit Participation Rate for Tax Year 2005 (Internal Revenue Service: no date), Table 8. Specifically, Virginia’s social services department conducted a “random assignment” study to test whether mailers and automated phone calls boosted EITC claims. Researchers, sometimes in collaboration with the Internal Revenue Service, have conducted similar studies to evaluate EITC outreach efforts nationwide. See, for example, work by Day Manoli at http://www.daymanoli.com/researchpapers/ . Specifically, California could explore the possibility of linking MEDS, a database of people participating in major public programs, to wage withholding data from the EDD in order to identify public benefits recipients who are potentially eligible for the CalEITC based on their earnings from work. This information could then be shared with the FTB to determine which of these individuals did not file state income taxes in the prior year. These “nonfilers” who are potentially eligible for the CalEITC could then be targeted for direct outreach on the credit, and the effectiveness of this outreach could be evaluated by tracking whether these individuals eventually filed their state taxes and claimed the CalEITC. See endnotes 38 and 40 for information about researchers who have conducted, or are currently conducting, such evaluations. Currently, these grants support CalEITC promotional efforts for a limited time, from November 2016 through May 2017. For more information about this grant program, see Department of Community Services and Development, Notice of Funding Availability (NOFA) California Earned Income Tax Credit Education and Outreach Grant: 2016 Cal EITC NOFA (August 15, 2016). Research shows that many people at the low-end of the income scale experience large swings in their incomes from year to year. See, for example, Andrew Stettner, Michael Cassidy, and George Wentworth, A New Safety Net for an Era of Unstable Earnings (The Century Foundation: December 15, 2016). In addition, studies find that a sizeable share of the US population falls into poverty for short periods of time. See Bernadette D. Proctor, Jessica L. Semega, and Melissa A. Kollar, Income and Poverty in the United States: 2015 (US Census Bureau: September 2016), p. 3 and Robin J. Anderson, Dynamics of Economic Well-Being: Poverty, 2004-2006 (US Census Bureau: March 2011). The Legislature could direct the Department of Community Services and Development, which administers the current grant program, to contract with an independent, research-based institution with expertise in program evaluation. The Legislature has required such evaluations in the past. See, for example, SB 1041 (Committee on Budget and Fiscal Review, Chapter 47 of 2012), which required the Department of Social Services to contract with a research organization to evaluate changes in the California Work Opportunity and Responsibility to Kids (CalWORKs) program. There are many free online filing programs that could be used in these workshops, including: MyFreeTaxes.org, which is operated by United Ways of California; Free File (freefilealliance.org), a nonprofit coalition of tax software companies in partnership with the IRS; and CalFile (https://www.ftb.ca.gov/online/calfile/), a free, online filing program operated by the Franchise Tax Board that allows tax filers to automatically import information from their W-2 forms, which summarize workers’ annual wages and the amount of taxes withheld from their paychecks. Self-filing workshops would not require as many volunteers as VITA sites require, and the volunteers would not necessarily need to be as highly trained. VITA sites typically provide one-on-one tax preparation services by volunteers who must be certified by the IRS after completion of a tax-training course and passage of an exam. Research suggests that “a substantial majority of [federal] EITC filers have such limited literacy as to seriously compromise their capacity to prepare their own tax return.” See Michael I. O’Conner, Tax Preparation Services for Lower-Income Filers: A Glass Half Full, or Half Empty? (Tax Notes: January 8, 2001), p. 8. An estimated 40 million to 80 million Americans lack the skills necessary to fill out IRS forms. Edward E. Gordon and Elaine H. Gordon, Literacy in America cited in Joseph Bankman, Simple Filing for Average Citizens: The California ReadyReturn (State Tax Notes: June 13, 2005). Also, more than one-quarter of adults living in households with annual incomes below $10,000 lack basic literacy skills. Mark Kutner, et al., Literacy in Everyday Life: Results From the 2003 National Assessment of Adult Literacy (US Department of Education: April 2007), p. 32. The majority of Californians who claim the federal EITC pay to have their taxes prepared in spite of their modest incomes (see endnote 8), and many people who claimed the CalEITC in 2015 also appear to have paid to file. VITA sites offer free tax assistance to people who generally make $54,000 or less annually. According to United Ways of California, the majority of California VITA sites offer services for limited hours during the week, many sites lack enough volunteers to meet the demand for services, and few have full-time, paid coordinators who can help them run more efficiently. Also, as noted earlier, many communities where large shares of households are likely eligible for the CalEITC lack VITA sites altogether. State support could allow VITA sites to hire a full-time coordinator, train additional volunteers, and expand their hours of service. Iowa and Virginia have provided state funds to support EITC outreach and expand free tax preparation services. For more information, see National Conference of State Legislatures, Tax Credits for Working Families: Earned Income Tax Credit (EITC) (February 21, 2017). Tax preparation fees are rarely transparent, as discussed earlier. Therefore, it would also be useful for California to require tax preparers that charge for their services to specify their fees before tax filers begin the process of preparing their taxes. For example, preparers could be required to display their fees for each tax form and service they provide. See Chi Chi Wu, It’s a Wild World: Consumers at Risk From Tax-Time Financial Products and Unregulated Preparers (National Consumer Law Center: February 2014), pp. 18-19. These services could be provided at various community locations, such as schools, libraries, food banks, and one-stop centers, which offer employment-related services to people who are searching for work. VITA sites typically provide one-on-one tax preparation by volunteers who must complete a tax-training course, pass an exam, and be certified by the IRS. Communities that have difficulty establishing or expanding these services could consider establishing self-filing assistance programs, in which volunteers help clients file their taxes on their own using free, online tax filing software. Some VITA sites provide such self-filing services, called Facilitated Self-Assistance (FSA), in order to expand their capacity without having to recruit additional IRS-certified volunteers. See Shervan Sebastian, Ezra Levin, and David Newville, Strengthening VITA to Boost Financial Security at Tax Time & Beyond (CFED: June 2016) and Rebecca Thompson, Learn More About Facilitated Self Assistance for Your Clients! (CFED: February 22, 2017). Free tax filing programs are underutilized, suggesting a need to better promote these services. For example, less than 2 percent of the nation’s tax returns in 2016 were filed through Free File (freefilealliance.org), a nonprofit coalition of tax software companies in partnership with the IRS, even though this service is available to 70 percent of tax filers. See Jessica Huseman, “Filing Taxes Could Be Free and Simple. But H&R Block and Intuit Are Still Lobbying Against It,” ProPublica (March 20, 2017). These two projects are being conducted by Jacob Goldin, an assistant professor of law at Stanford University. The first study, which is being conducted in Colorado in collaboration with the Colorado United Way Network, is testing the effect of sending postcards promoting United Way’s free, online tax service, MyFreeTaxes, to a random sample of households in low-income neighborhoods. The second study, which is being conducted in collaboration with the US Treasury Department and the IRS, is testing the effect of sending postcards promoting various types of free tax preparation services to people who are likely to qualify for these services and who prepared their own tax returns in the prior year. The preliminary results of this research should be available in the late spring or early summer of 2017. The data-sharing project discussed earlier would make it possible to identify “nonfilers” who are likely eligible for the CalEITC. Notices about free tax preparation services could also be mailed to a broader group of individuals with low incomes — not just those who qualify for the CalEITC — given that use of paid preparers is high among this group. The Employment Development Department (EDD), for example, could mail such notices to workers with low earnings based on their wage withholding statements or to people who apply for unemployment insurance. The EDD is currently required by law to notify unemployment insurance claimants that they may be eligible for the CalEITC and federal EITC, but the notification does not have to include information about free tax preparation services. AB 650 (Lieu, Chapter 606 of 2007) requires most employers to notify their employees that they may be eligible for the federal EITC. This notification must occur within one week of providing an annual wage statement, such as a W-2 or 1099 form. (The specific statement employers are required to provide is posted on this website: http://www.edd.ca.gov/Payroll_Taxes/Year-End_Notification_Requirements.htm.) AB 1847 (Stone, Chapter 294 of 2016) requires this notification to include information about the new CalEITC. However, the current notification is not required to include information about how to access free tax filing assistance. Providing this information could help encourage people who do not have a filing requirement to file. California could also consider simplifying the information that employers are required to provide. A recent study tested the impact of mailing various types of notifications to more than 35,000 California tax filers who appeared to be eligible for, but did not claim, the federal EITC in tax year 2009. The study found that simple notices that included how much tax filers might receive from the EITC were most effective in boosting EITC claims. Examples of these notifications can be found in Saurabh Bhargava and Dayanand Manoli, “Psychological Frictions and the Incomplete Take-Up of Social Benefits: Evidence From an IRS Field Experiment,” American Economic Review 105:11 (2015), pp. 3489-3529. In order to keep the survey short and simple, the survey did not ask respondents to report earnings from spouses or anyone else in their household. This means that some respondents’ estimated eligibility for the CalEITC could be incorrect. For example, some respondents who did not work, and therefore were assumed to be ineligible for the credit, may actually have been eligible if their spouse had earnings that would have qualified the family for the credit. Respondents were considered to have worked in 2015 if they reported a positive number for at least one of two questions: the number of months they worked in 2015 and/or the number of hours they usually worked per week during those months. Due to incomplete information, annual earnings could be estimated for only 80 percent of respondents who worked in 2015. Annual earnings were estimated based on respondents’ hourly pay, usual hours worked per week, and total months worked in 2015. Respondents’ estimated annual earnings ranged widely, from $6,890 at the 25th percentile to $22,741 at the 75th percentile. Another 13 percent reported that they did not work, but someone else in their household did, while 28 percent of respondents reported that no one in their household worked.